The birth of science is based on a strict dissociation of scientific knowledge from the various aspects of practical knowledge. The ideal of scientific knowledge as it was shaped in antiquity is still influential today, although the conception of science and the relationship between science and the life-world has undergone major changes. The emergence of transdisciplinary orientations in the knowledge society at the end of the 20th century is the most recent step. The Handbook focuses on transdisciplinarity as a form of research that is driven by the need to solve problems of the life-world. Differences between basic, applied and transdisciplinary research, as specific forms of research, stem from whether and how different scientific disciplines, and actors in the life-world, are involved in problem identification and problem structuring, thus determining how research questions relate to problem fields in the life-world. 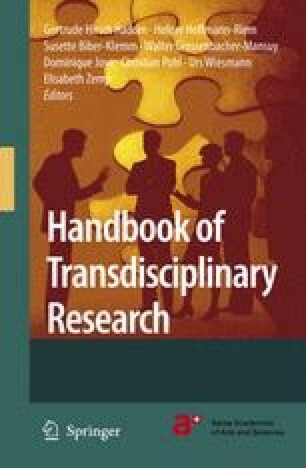 However, by transgressing disciplinary paradigms and surpassing the practical problems of single actors, transdisciplinary research is challenged by the following requirements: to grasp the complexity of the problems, to take into account the diversity of scientific and societal views of the problems, to link abstract and case specific knowledge, and to constitute knowledge with a focus on problem-solving for what is perceived to be the common good. Transdisciplinary research relates to three types of knowledge: systems knowledge, target knowledge and transformation knowledge, and reflects their mutual dependencies in the research process. One way to meet the transdisciplinary requirements in dealing with research problems is to design the phases of the research process in a recurrent order. Research that addresses problems in the life-world comprises the phase of problem identification and problem structuring, the phase of problem investigation and the phase of bringing results to fruition. In transdisciplinary research, the order of the phases and the amount of resources dedicated to each phase depend on the kind of problem under investigation and on the state of knowledge.